The following support article is to help you set up metric weightings for additions, this allows the additive calculator to work out how much of a addition is required to reach the desired metric level. Click on images to view a larger version, if you would like to view them in a second window simple click on them with the middle mouse button. This is commonly used for KMBS or PMS, CUSO4 and a variety of other sulfur additions/solutions. Access your Sandbox database to set this up and test it out before doing the same in your Production database. 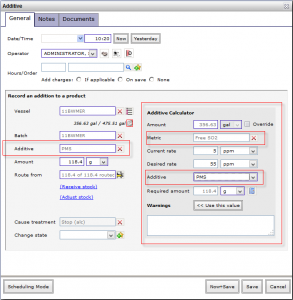 This involves setting up the Metric and the Addition and then using the addition calculator. Head into the Winery setup as shown below, into the Production folder and then into the Metrics category. In this example I am using Free SO2, the important thing on this form is the ppm to g/L factor. If you know your ppm to g/L factor you can enter it here, otherwise 0.001 will generally do. Once this is entered save the metric. Head into the Additive category now and select the addition you want to tie to the metric. In this case I have used PMS/KMBS. In the screenshot you’ll notice I have outlined three areas in red. The right hand side is where you select a metric and assign a weighting to it, this weighting is the percentage of this addition that will contribute to the metric. Clicking the Add button on the centre box will add it to the metric weighting list. In this case 57% of the PMS addition will contribute to the Free SO2 metric. Finally the Rate unit field is important as the rate of addition will be set to PPM. In theory everything is ready to be used now, so next is using the addition calculator. Exit the winery setup and head into the operations menu, select additive to start a new addition operation. In the screenshot below I have marked out several areas in red, on the left you’ll see I have selected PMS as the addition. On the right is the addition calculator, you will need to select the metric you want to use in the calculation (in this case Free SO2). You will also need to select the additive if there is more than one additive that has a metric weighting for this metric. Next you will need to fill in the current rate if this metric has not been tested or has been invalidated in the system (via blending for example). After this fill in the desired rate and press the calculator button. Double check that the required amount looks right, if you are happy with the amount click the [< < Use this value] button to drop the amount into the left hand side. Remember if you have any questions or come across any problems feel free to contact support.